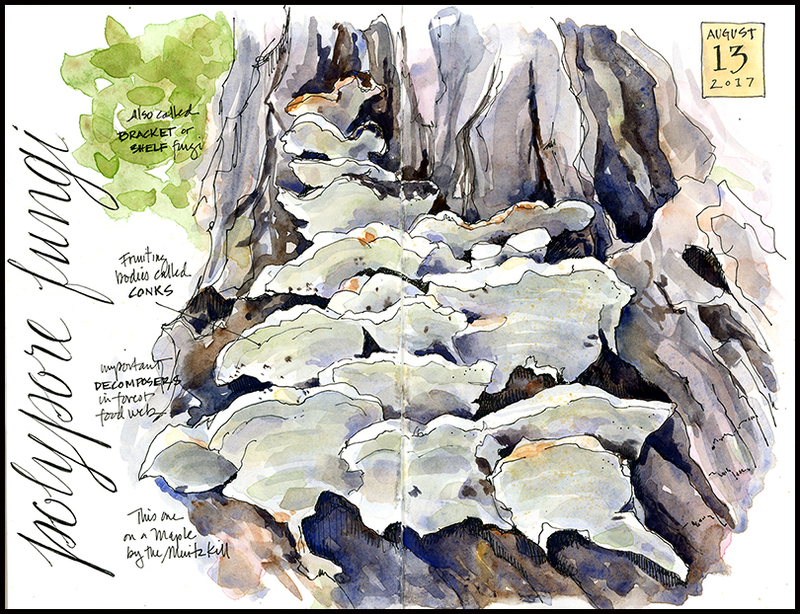 This entry was posted in Journal, Watercolor and tagged fungi, home, natural history illustration, trees by Jean Mackay / Drawn In. Bookmark the permalink. Wonderful subject matter and beautifully rendered. Thank you for the advice on how to achieve this ‘look’ – I greatly appreciate the tips. Thanks…glad the tips are helpful. Love discovering these things too. Coincidentally, just yesterday took a walk to my favorite woods and started particularly looking for fungi and mushrooms, easy to overlook if not concentrating on finding them, under leaves, etc. . So many sizes, shapes and colors from bright red to black and white. Was going to try a page with all the different kinds on it, now I have great instructions on how to do the white ones! Thanks, Jean. It seems like this is a time of year when a number of fungi are out. I’ve been seeing lots. Glad I had a chance to paint these. Enjoy studying and painting the ones you see. Jean, I hear your story about enjoying the challenge of painting uncommon objects in nature. I love your attempt to paint the (we call them barnacles) growing on the trunk of the tree. The colors representing white work perfectly against contrasting dark values in the trunk. Well done. I look forward to seeing your future posts on the fields of grass, forest and scenery in the close environment where you live. Nature has so many wonderful treasures to discover and you tell their story beautifully. Thank you for sharing. Thank you for embracing beauty’s many forms. Wonderful! Thanks Lauren. Yes, so many forms of beauty! Your sketchbook drawings are so ‘complete’, just beautiful. And I am with you, love the hidden and sometimes unusual shapes and forms of things such as fungi. They make interesting subjects, and sometimes my goal in painting them is to share that beauty on the page. The polypores always catch one’s eye, I think, especially when fresh – nicely done, and great advice, too. This grouping really stands out, both because they are so white and so large. I love this, and I love your wonderful description of the process in creating the painting. Glad you found my blog and enjoyed poking around. Looks like we have similar likes…good luck with your quest for birds. Thank you! I never cease to marvel at our feathered friends!